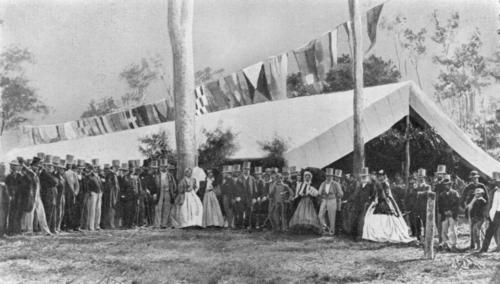 On Friday 31 July 2015, Queensland celebrated the 150th anniversary of the opening of its first train line from Ipswich to Bigge’s Camp on that date in 1865. For a colony that had separated from New South Wales less than six years earlier, this engineering feat was quite an achievement and more was ahead with the extension of the line to Toowoomba at the top of the Great Dividing Range. I’ve often wondered if several sets of my ancestors were there, in the background, when the first train puffed its way out of Ipswich that day. After all, the Kents, Kunkels, and Partridges were all living there at the time. It’s even possible that George Kunkel snr had started his association with the railway around this time, but it’s impossible to know. Without a doubt, life on the line was vastly different to the ceremony held that day to celebrate the first train trip. Men worked hard physical labour in the heat and challenges of the bush. Their wives lived in tented camps, they birthed their children, lost some to disease, managed their households and somehow brought their children up. Catholic priest, Fr Dunne, later Archbishop of Brisbane, described the railway camps as “fly pests”. While the camps offered a variety of facilities, it was down to the contractor, the men and their families to make the best of things. They were surely physically and mentally strong. Over the years of blogging I’ve often mentioned I have railway tracks running through my blood stream. It’s certainly true that my ancestors have been involved with the railway almost since its very beginnings in Queensland. Let me give you a summary, working back from me. Mum: worked as a typiste in the Goods Office at Roma Street railway station and yards. Working there she knew Dad’s paternal uncle, Jim Kunkel. 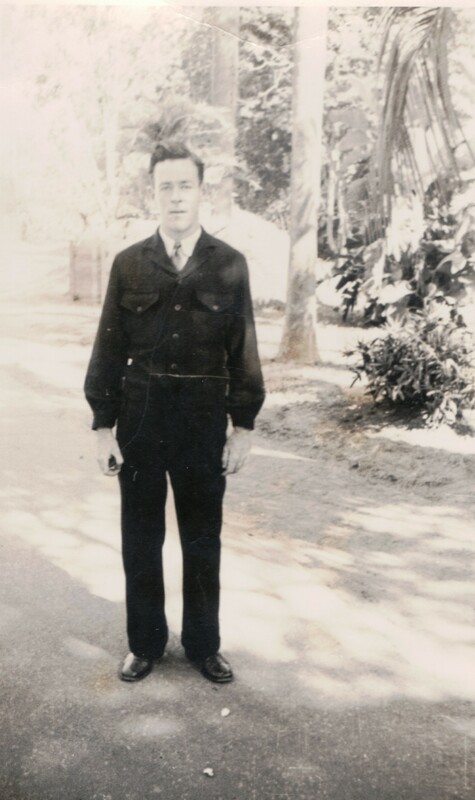 Dad: started work as a junior worker at Landsborough when he was 16 then later became a lad porter and porter at Central, Maye, Tweed Heads and Roma Street. His service at Roma Street extended for over two decades and if only there had been Fitbits then we might know how many miles he clocked up in his job as a numbertaker (sometimes known as a tally clerk). From Roma Street to the Exhibition grounds multiple times each 8+ hour shift meant he was fit but the hazards of coal dust made a mess of his lungs, compounded by smoking of course. He also told us that he had seen snow falling one winter’s night-shift…a topic that was recently debated on the Lost Brisbane Facebook page. Denis Joseph Kunkel (1880-1965). The original is held by Pauleen Cass. Not only did Grandad work on the railways all his life, he also served with the Australian Broad Gauge Railway Operating Company during World War I. I wrote his story here for an Australia Day theme. My Irish grandfather also had a life-long association with the railway, as a worker and child of a railwayman. He worked as a carpenter in the railway workshops in Townsville and Ipswich. He was a high energy man, and when normal people were retiring he moved across to work for Commonwealth Engineering. You can read some of his story in this newspaper advertisement and also in my post linked above. I believe this may be George Michael Kunkel and his wife, Julia Gavin. 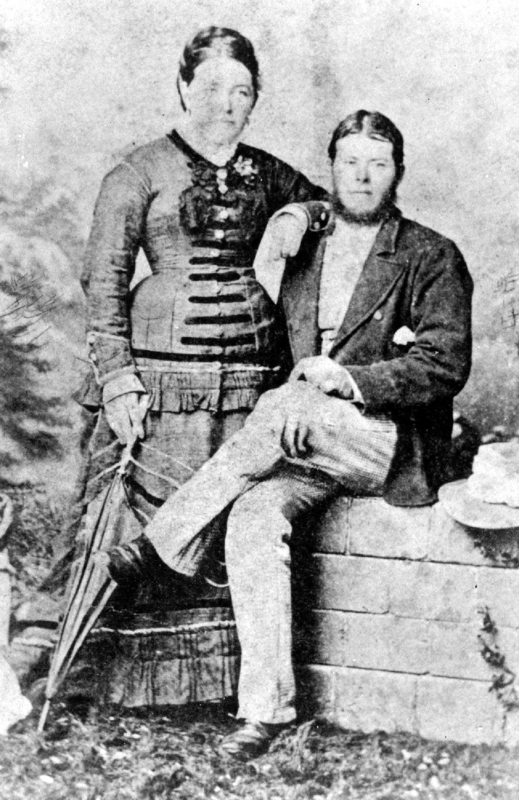 George Michael Kunkel commenced working with Queensland Rail in 1878 (aged 20) though it’s possible he may have worked for a contractor prior to that. Certainly he was working as a lamber on Jondaryan Station in 1875 when he appears to have met his wife. Julia Celia Kunkel, nee Gavin, was also employed on the railways, working as a gatekeeper. 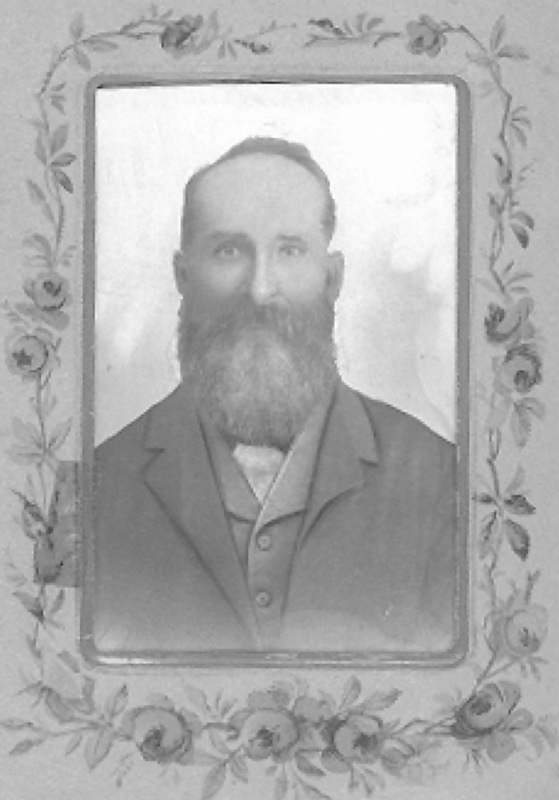 Peter McSherry/Sherry arrived in Rockhampton on 5 May 1884. Ten days later he commenced work with Queensland Rail as a ganger and remained in service with them until 1931 when he retired as a Chief Inspector. His service took him through much of central, western and northern Queensland: to Longreach, Hughenden, Townsville, Cairns, Mackay and Rockhampton. My suspicion would be that Peter had already worked on the Irish railway at Wexford, given he was 23 on arrival and his father also worked for the railways there and in Queensland. 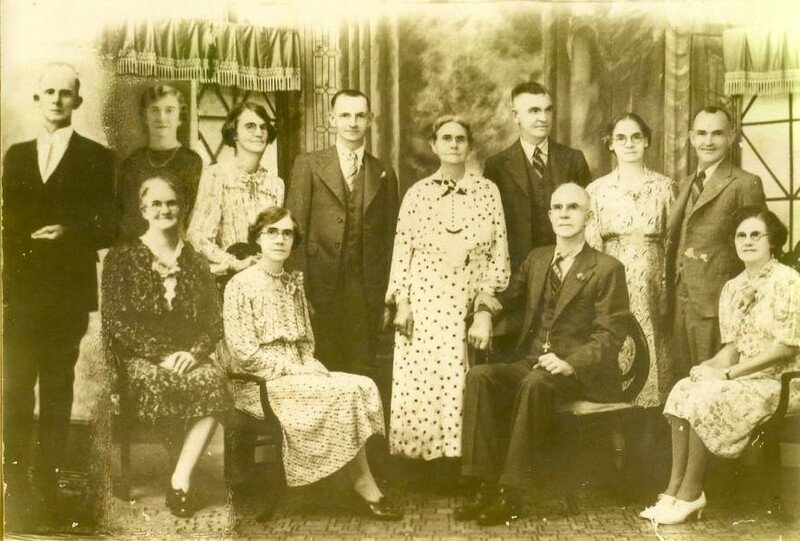 My McSherry great-grandparents and some of their children, kindly provided to me by a cousin. 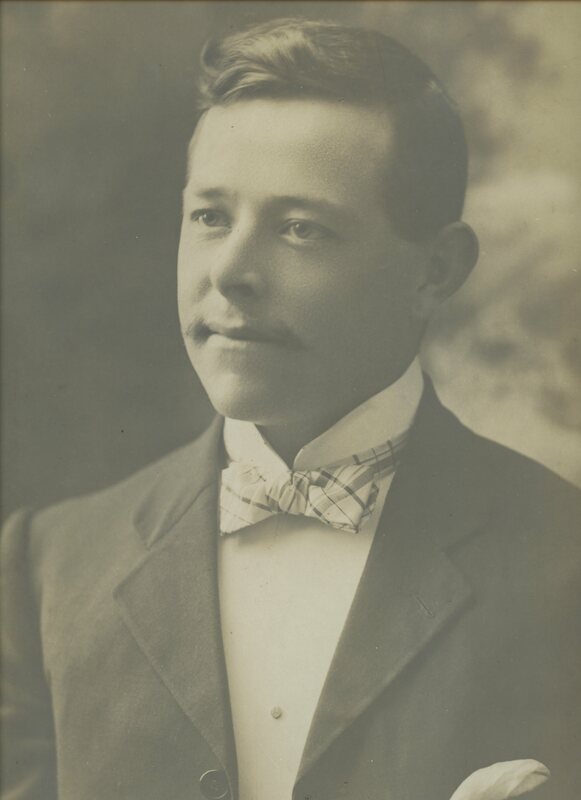 Paternal 2xgreat grandfather: George Mathias Kunkel, born Bavaria, followed the railway line west towards Toowoomba but it’s not known if he worked as a labourer or perhaps as a pork butcher and sausage maker, an occupation he’d followed on the Tooloom goldfields a few years earlier. The official records place him “on the books” from June 1875. He continued his labouring work on the line until an old man, living in a humpy near the line while also maintaining the farm at the Fifteen Mile, with the help of his wife, Mary O’Brien Kunkel, and their children. Maternal 2xgreat grandfather: James McSharry/Sherry was working on the Irish railways at the time of his marriage and his children’s births. Given the path of their births it seems evident he was employed on the Dublin, Wicklow and Wexford railway. James, his wife Bridget and eight of their children arrived in Rockhampton in January 1883, no doubt something of a shock. James worked for the railways in Queensland but it seems he may have been employed by a contractor. James McSharry (only Peter changed from Sherry to McSherry), is my major brick wall and my most wanted ancestor. 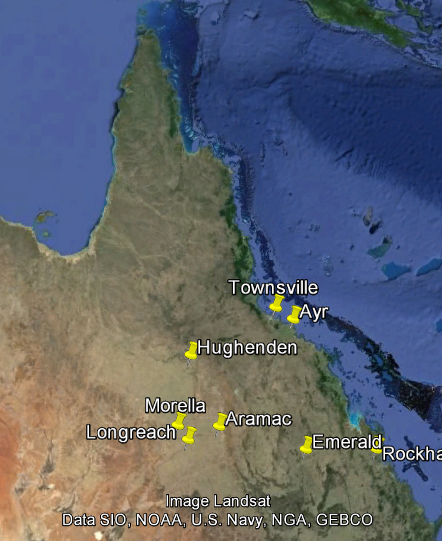 This is a map of Queensland, showing the places mentioned in the McSherry story. You can see why I was determined to steer clear of railwaymen when I was growing up! Of course railway employment was considered stable work. It was also often hazardous and peripatetic. Living with Dad I was all too familiar with the dangers faced by the men working in the shunting yards as he would come up shocked and quiet, then tell us of another young man who’d lost a leg, had his guts squashed, or been decapitated (the worst accident that happened). My other family lines mostly stayed away from work on the railways though the sons of my Gavin line were also railway employees. I think it’s not too bold a claim to say my families earned their small place in Queensland’s railway history. 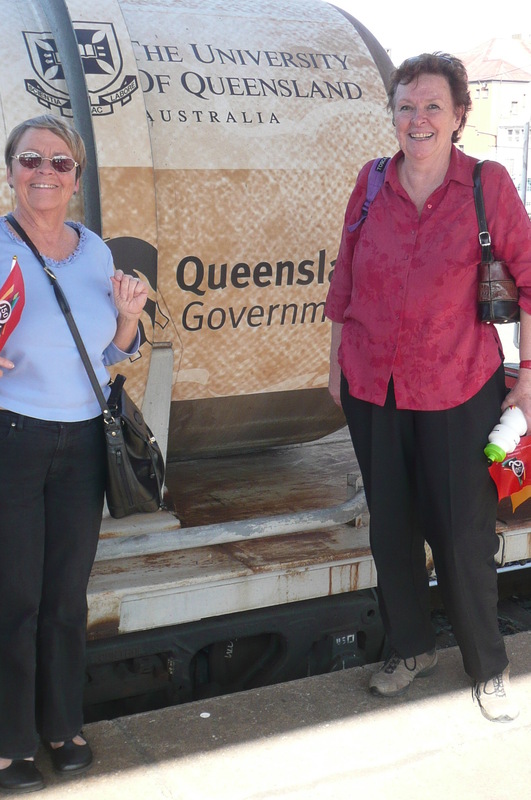 Back in 2009 my friend joined me on the Q150 steam train trip from Brisbane to Toowoomba. 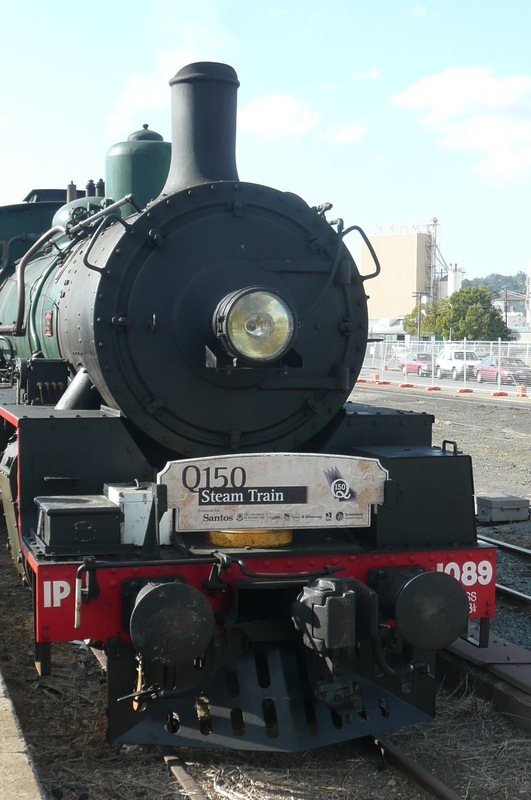 This entry was posted in Queensland Rail by cassmob. Bookmark the permalink. Agreed David. I have so many memories of trains. Fascinating history. My interest was also caught by the widths of the women’s skirts in the 1865 picture. How did they manage to get around. At least it was winter. I agree, I can’t imagine how difficult it would have been to work looking after their families in all the clothes expected of them. The upper classes in the image were at least dressed just to look good. Catching up on my blog reading, Pauleen. Shame on you for not following the railway tradition. Had to check to see what you have been up to lately. Interesting to see how RxR and trains are a common thread in your family. I was wondering whether it is an Australian phenomenon or just in some families. When I get my Australian history from blog reading it can sometimes be skewed. By the way the 1865 and 1880 photos were especially evocative. Good to hear from you again Joan. 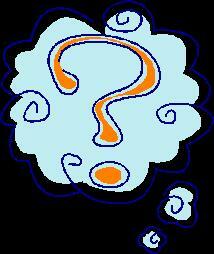 I’ve been neglectful of my blog and blog reading lately as we prepare for an interstate move. I think working for the railway was quite common with the early immigrants. Their arrival coincided with the railway boom, many were relatively unskilled except for labouring jobs, and once employed there was generally a reliable job and income source (though not always). I liked the way you highlighted the generational lins with the railways. What struck me too was the date – 1865, as that was only two years after the railway rached by village Earlston in the Scottish Borders. yes, once the railways were pivotal around the globe weren’t they? And very quickly too. It is good, Pauleen, to see you back on the blogosphere. I find railway history so fascinating and I enjoyed researching my own village line which ran for just over a 100 years. In the Scottish Borders, we are marking the reopening of part of the old Waverley line which closed in 1969. We were the only mainland region in Scotland without a rail station, so it is marvellous that we can now travel to Edinburgh and points North by train. It made me think back how exciting our ancestors must have felt when the railway reached their communities. Good luck with your house sale and move! Hi Pauleen, James McSharry is also my maternal 2xGreat Grandfather and is also my stumbling block. I visited the Wexford, Wicklow, Tullamore area last year just to get an idea of where the family lived. I was travelling with my husband and teenage daughter at the time so couldn’t really do any record or cemetery searches. The family did have a lot of sadness when they came to Australia. My Great Grandmother was James McSharry’s daughter (Kathleen May Mcsharry). Good luck in your search and I will let you know if I come up with anything.